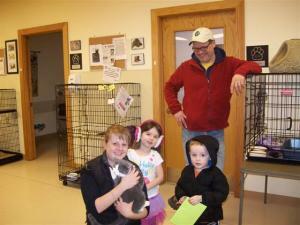 Our Pet Adoption and Resource Center in Verona is our primary adoption site. View our other adoption events here. Our foster homes bring in their foster animals each weekend to meet potential adopters. Look around our adoption room to meet adoptable cats, and then get acquainted with your potential pet in one of our meet and greet rooms. Our volunteers are ready to help you make a great match for your household. We’ll ask you about your family, any current pets, preferred cat personality, and other questions to help make the purrfect match! Submitting an application prior to your visit will help streamline your adoption experience. First time pet owner? Never trimmed nails before? Not sure what pet food to feed? Questions about adopting a special needs pet? We’re happy to give you the resources you need for a successful adoption. Our Pet Adoption and Resource Center features an 800 square foot retail space featuring a wide variety of essentials and specialty items for your pet. We offer the convenience of picking up all the items you will need for your new friend at the time of adoption. We only sell items that our volunteers and animals have tested and approved. You’ll love our selection of toys, pet behavioral products, cat foods, bedding, and more. Our prices are very competitive with other retailers, and all profits go directly back to funding our mission of helping homeless pets! Find out more here. In addition to animals for adoption, Angel’s Wish also has a variety of resources for potential and current pet owners. Education is an important part of adopting a new family member, as well as keeping animals in their homes for life. We have educational handouts available at our Center on a variety of topics. Our retail store has specialty items available. We offer microchipping and cat nail trimming services.